Did you catch the Facebook Live broadcast from the Foot Forward Summit? What did you think of the information from the guests? A highly talented graphic artist, her son created both of our individual logos. This made him the ideal candidate to create one logo for the NailOn moniker. What do you think of our #NailOn logo? 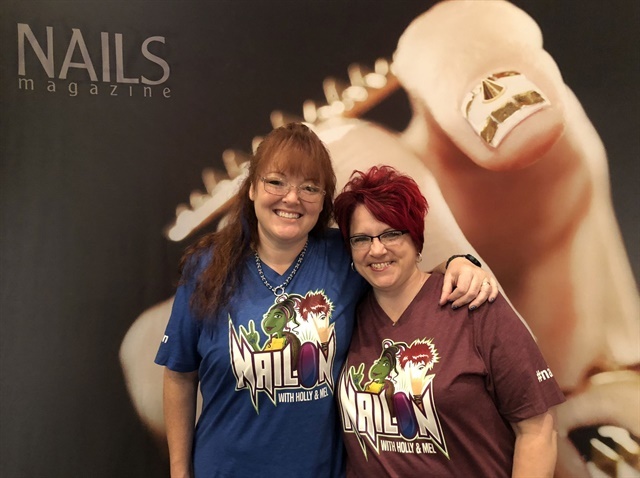 To summarize, this means that NailOn with Holly and Mel is a monthly broadcast on the NAILS Magazine Facebook page that occurs the second Monday of every month at 9 am PST, 10 am MST, 11 am CST, Noon EST, 5 pm London, 6 pm Denmark, 2 am Sydney (on Tuesday morning), and 4 am Auckland (on Tuesday morning). To follow our adventures, show us something cool you’ve done with nails, or or suggest a topic you would like us to cover on a broadcast, feel free to use #nailon or tag us on social media!